Drink More Water | Hydratem8 Bottle Review! One of my New Years resolutions (as always) was to lose weight and I guess just try and be more healthy in general. One way I can "make the change" is the increase my water intake. I will happily admit that I don't drink as much water as I should and the main reason is that I find it boring. Yes, I'm a child. To help motivate to get drinking, I started looking online to find the perfect water bottle and that's where I found Hydratem8. 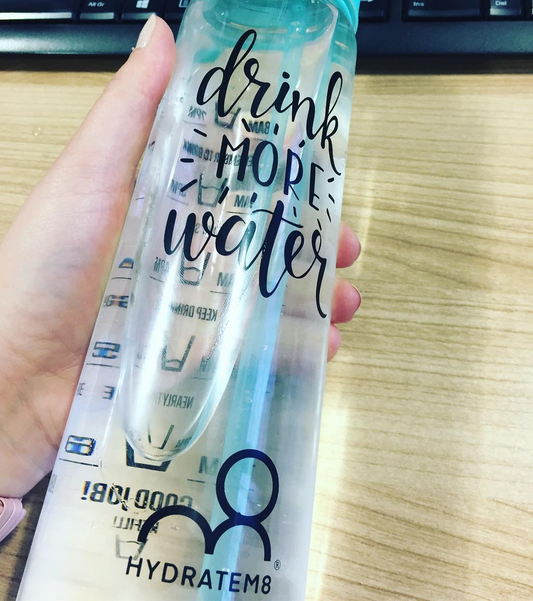 Now I know there are loads of other companies that have started making these "measuring chart" style water bottles but Hydratem8 was the first company I saw so I bought from them. I personally would have shopped around a bit before as I think their prices are quite high for what you get but oh well! I've been looking at Hydratem8 for a while and although the price put me off, I did like the idea of being able to see how much I've been drinking and to push myself to drink more. After the release of two new bottles, I decided to take the plunge and pick up their teal bottle. Delivery was super quick and the next day I was filled up and ready to go! The first day went really well and although I did find I was lagging behind a bit in the morning. After using for a few days I noticed I was drinking more on my own, without having to look at the measurements to see where I should be. It's like it trained my brain to drink! If you're looking for that health boost on the build up before Summer than try out a bottle today!